The Suiattle River Road washed out in 2003. Minor Repairs opened it to Downey Creek. In 2006 it washed out further, 10.5 miles from the end. In 2007 Kim talked me into biking to the end of the road, camping, and hiking up Sulphur Mountain. Now, 10 years after the original washout and 7 years after the road was closed 10.5 miles from the end we chose to make a return visit. At long last, after environmental review and another and a law suit and another review repair is finally about to begin. The road will soon be closed for a good part of the next two years as construction goes forward. We arrived at the trailhead Saturday at the not so early hour of 12:15 pm. George accompanied us as far as Downey Creek at 8.5 miles. It was warm but not uncomfortably so. We put as much heavy gear on the bikes as possible and shouldered our backpacks for the ride. While I have done a number of bike rides down the Suiattle Road I will not be sad to see it repaired. So many great trips are just out of reach for those of us with minimal vacation time. Sulphur Mountain is a great strenuous day hike with 10 miles round trip and 4700' of gain from the road end. It is a long strenuous full weekend for most folks now. The ride in is a gentle uphill most of the way. Not steep but hard to maintain a good speed. Much easier on the way out. We stopped at the Buck Creek bridge. The old CCC built campground next to the creek has seen few visitors the last 7 years. That will soon change. We took a long stop at Downey Creek. We were surprised to see some salmon in the river. We bid goodbye to George here and then headed on to the end of the road. The road is narrowing as small alder trees are encroaching on both sides. On last stop at the Sulphur Creek campground. Alder trees have completely filled in the road. This will soon change and families will have a close in place to camp in the mountains once again. At the end of the road we set up camp for the night. The log across the Suiattle that I saw last year is still in place. With the roaring river below I don't think I'd try to cross but it is big enough to walk across if one has the courage. The river only takes up a fraction of the wide riverbed. It is hard to image the flow of water in the big 2003 and 2006 floods. We spent the evening down on the river bank. It was dark by 8:45 pm and we headed to bed. Sunday morning we packed up. Water pumped at Downey Creek the day before was mostly gone. The Suiattle was as much sand as water. Way to milky to pump water. We hoped to find a little water left at the creek a short way up the trail. Just a few minutes down the Suiattle River Trail we came to the Sulphur Creek Trail. It starts out very steeply. The forest is completely covered in moss. A very beautiful section of forest. After about 250' of gain we dropped down to the creek. Calling it a creek is generous. The small creek was still flowing ever so minimally. Enough to pump water. We used every ounce of water we carried. The trail never seems all that steep but it relentlessly gains elevation. There are many switchbacks along the way. The forest is dark with little underbrush. There are no other water courses except for a small seep. That is easy to spot as it is lined with devils club. That is the only place wet enough for them to grow. The dark forest is a natural place for saprophytes. Plants that do not need sunlight for photosynthesis. We saw Indian pipe, candy stick, and several other varieties. Many were past peak but some were going strong. There are half a dozen big trees down across the trail. One we had to crawl under. The others we climbed over. One big tree fell where it crosses the trail three times, right by a switchback. Other than that, the trail is in fine shape. It does get very narrow in spots on a very steep hillside. A slip would not turn out well. Still, with normal care it is fine. We climbed up and up and up some more. Having done it only once I had only a few landmarks remembered. The trailhead is at only 1600'. The old lookout site is at 6200'. We were getting a bit tired when we began to leave dark forest for open forest and sloping meadows. Finally the ridge came into sight. Switchbacking up we finally had our first views of the day. To the west were Green Mountain and Downy Mountain. Far far below lay the Suiattle River. A few minutes later we crested the ridge. Now we could see north and east as well. There were clouds covering much of Dome Peak. The real summit of Sulphur Mountain was in the clear. 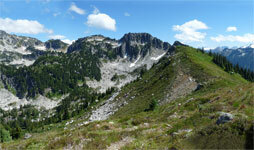 A last short climb brought us to the top and views over to Glacier Peak. The bottom of Glacier Peak. The rest was in the clouds. Later the top would peek out too. The clouds over Dome and the Ptarmagin Traverse peaks did clear up. Down below us lay Sulphur Lake. That would be the one source of water for backpackers. It was 2:00 when we arrived and we still had 4600' to lose then an 10.5 mile bike ride. We did not have nearly enough time to spend on top. After half an hour we packed up and headed down. We did make much better time coming down. It took about 3:10. The trail is pretty soft and there are very few natural steps and no man made ones. Not that hard on the knees even with all that elevation to lose. Bugs were not too bad though there were some biting flies. They seemed to like Kim more than me. We took lightweight hiking shoes for the biking and they were fine for the steep hike. By 6:20 pm we were packed up and on our bikes heading out. Downhill was very nice. There are a couple hills heading out but we had no trouble riding up them. It took only 1:20 to reach the truck. At 7:40 pm we still had almost an hour of daylight left. My second time up was just as enjoyable as the first. On the first trip the clouds were much thicker. We had only fleeting views. This time only the middle of Glacier Peak was lost in the clouds. I'll just have to come back for those views. When the road is repaired I'll be back for another visit.